This beautiful stately building was built around 1900. It was completely renovated and furnished as a B&B/Hotel with private residence in 2008-2009. 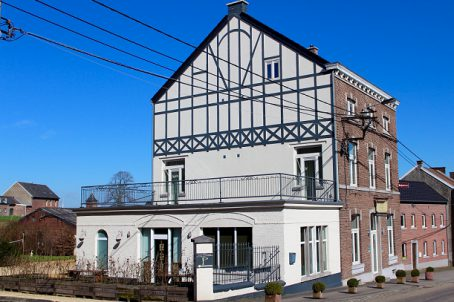 The property is currently rented as a holiday home for 20 people (classification by the Flemish Government: 4 stars). Until the end of 2017 it served as a B&B with “guest table”. All current comfort and safety standards have been met. There are inspection certificates of electrical installation and fire protection. Fire-proof interior doors were placed and there is a fire alarm power station. The EPC value was set at 71. The building has 8 guest rooms each with its own sanitary facilities (shower, toilet, washbasin). The authenticity was preserved among other thanks to the preservation of the original wooden floors and central oak staircase. Three separate Dry Cellars: 1) fuel cellar with new boiler and heating boiler (300L) on gas. 2) Large storage space. 3) Small storage room (beverage cellar). Hall: With exterior doors on the front and rear; Inside doors to the basement, the kitchen, the lounge, the playroom, the laundry room and to a toilet; Access to the stairs to the floors. Coat racks and shoe racks. Kitchen: Comfortable spacious kitchen fully installed with professional appliances: for example a stove with 5-hob rings and large oven, industrial dishwasher, large cooling,.... From the kitchen direct access to the dining room and the hall. Lounge: Pleasant warmly decorated sitting room with square lounge with 16 seats. Desk and bookcase. Direct access to the dining room and to the hall. Playroom: room with football table, sitting area with TV-DVD, library cabinet, board games. Washroom: Room with professional washing machine and tumble dryer, large freezer case, sink. Dining Room: Spacious dining area (+/-50m2) with tables and chairs for 20 people, antique wooden dinnerware cupboards, a drink-fridge, TV-connection and separate toilets. Access to the kitchen, lounge and adjoining outdoor terrace. Two furnished double guest rooms with TV, private sanitary facilities and access to an outdoor terrace. Two furnished 4-bedded rooms (bunk beds) with TV, private bathroom. Private apartment in loft style with built-in kitchen, living room, bedroom and dressing. Annexe wing with enclosed bicycle storage and separate storage space. Located in the beautiful “Voer-area” directly on the hiking network, the cycling network and the MTB network. Near the three country point and at cycling distance from Maastricht (NL), Aachen (D) and Liège (B). Price also includes website, membership tourism Voer-region and tourism Limburg and current reservations. Exploitation possible as a holiday home, B&B or hotel with or without restaurant. Sales and payment via a Belgian notary.